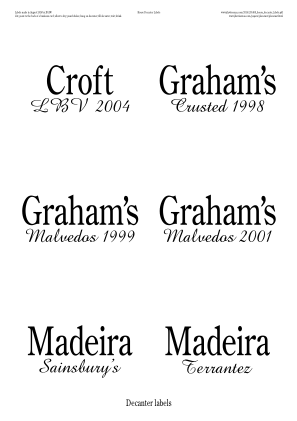 [url=http://www.theportforum.com/viewtopic.php?p=81054#p81054]Here[/url] jdaw1 wrote: There are a few fortified wines that make multiple appearances in the Wiseman household, and decanted. It was decided that decanter labels should be used. If your household needs like, request (in the thread entitled House decanter labels or by private message) and I’ll oblige. Edit: if you see a typo, reload images with ⌘R or Control-R. Alas not possible on Tapatalk. I do love the presumption that lies behind this kind offer. I must confess that I am rarely in danger of confusing the contents of my decanters when at home. I don't think I have ever been in a situation where life has been more complex than Port in the Port decanter, claret in the claret jug. The only time when I do need help is when we are at the Xmas offline - that can get confusing but the numbered decanter labels seem to do the trick. AHB wrote: I do love the presumption that lies behind this kind offer. 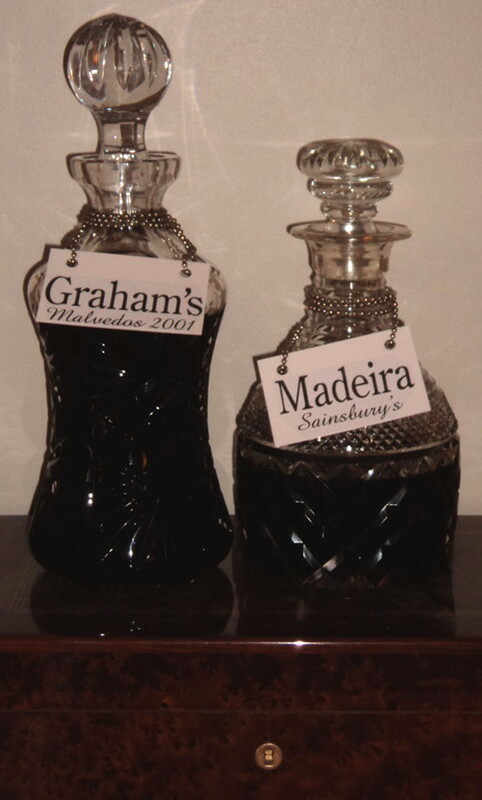 Madeira might sit in a decanter for weeks, while other decanters are used for other things. I think that it makes life a little more civilised, and at very little cost. Your mileage might vary. jdaw1 wrote: I think that it makes life a little more civilised, and at very little cost. Your mileage might vary. I am certainly not disagreeing with you. Merely observing that you might have more of a use for these than most others. I use a decanter more often than most people I know (although perhaps not more than most on this forum) but rarely would I have occasion to use decanter labels unless my Port Chums were coming round. And the Sainsbury’s Madeira goes really well with a Tesco Finest Christmas Pudding (apparently made with Courvoisier VS Cognac). I like them. Reluctantly I realise I don't currently have a need. Perhaps I should. Hmm. Are they printed on card? When you drink these wines on a regular basis, couldn't you just tell them apart by their their smell/aroma? But I must admit, that these labels really look classy. DaveRL wrote: I like them. Reluctantly I realise I don't currently have a need. Perhaps I should. Hmm. DaveRL wrote: Are they printed on card? AW77 wrote: When you drink these wines on a regular basis, couldn't you just tell them apart by their their smell/aroma? AW77 wrote: I must admit, that these labels really look classy. jdaw1 wrote: I think that it makes life a little more civilised, and at very little cost. I knew the answer would in front of me. My iphone made that bit of text rather small and hidden under a floating "open PDF with?" box! I bought some waterproof laser printer "paper" some years ago which would prevent red smears appearing on the label. DaveRL wrote: I bought some waterproof laser printer "paper" some years ago which would prevent red smears appearing on the label. Or is it time to dig out the office laminator? And I think they're lovely! Tell me what text you need and more will be made. Graham pair good. The investor in me shudders that I wouldn't want to label Tesco 1994. I have plenty of Bomfim and Vargellas 2001 but perhaps too soon. 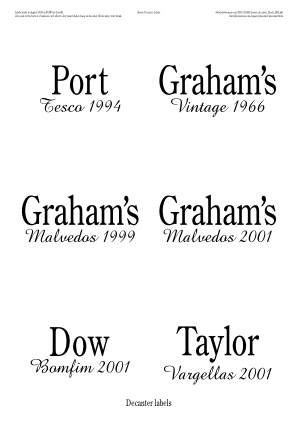 Would it be wrong to want a Graham 66 label (my birth year) pretending it was house port yet decant in anything to hand. Yes it would. Could be funny fooling the Inlaws though. If modifications needed, just ask. Thank you. Cutting and sticking entertainment. Even better yet, today being sold for only £6. I'm sure no one will have a need, but to tie a loose end, the tough waterproof laser printer paper I used is Zecom, and still sold, although I remember it being cheaper. Edit. Available as tie on labels too.